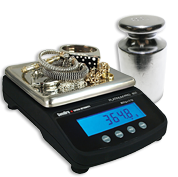 Shop the best scales for your jewelry store! You'll find accurate & easy to use digital items, with an electronic control panel & calibration function. Ready to use for diamonds, gold & other precious metals. Pick between large or pocket-sized pieces, all available at affordable prices, thanks to our regular discounts!